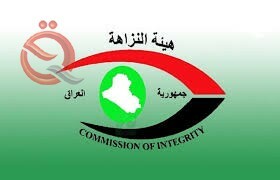 On Monday, the Integrity Commission issued a statement on "suspicions of acquisition" of two properties in a "privileged" location in Baghdad, citing a team to investigate and investigate the information contained in a television report. "The team visited the Office of the Inspector-General of the Ministry of Justice to verify the information contained in a satellite TV report regarding a citizen's complaint that the General Real Estate Registry and Al-Rusafa departments attempted to acquire two properties on the site In Baghdad, the area of ​​more than 170 donums belonging to deceased people, "explaining that" the citizen did not produce any official documents prove his claim about the land's land. " She added that "the work team, which was written on the instructions of the Chairman of the Commission after the information center of the Integrity Commission to monitor the complaint and forwarded to the Chairman of the Commission, approached the Directorate of Real Estate Registration in Rusafa; for the purpose of querying all real estate actions in the real estate subject of the complaint," noting that " The Directorate confirmed that one of the properties is subject to renewed registration procedures and the complainant has no relationship with him. The second property is divided into two properties, one registered in the name of the Municipality of Baghdad and the other subject to instructions 6 of 1991. She explained that "the visit of the Office of the Inspector General of the Ministry of Justice, and the meeting with the assistant inspector, who confirmed the formation of a committee to investigate the properties of research and verification of information that was charged by the Division of Studies of the Audit Department in the registration of real estate," noting that "the mechanisms of the Division of studies is to express an opinion And study the subjects referred to it for real estate transactions. The report added that the report said that "there is some delay in the completion of transactions in the division because of the small number of cadres," stressing that "legal proceedings are taken against any employee who proves his negligence or his intention to perform the tasks entrusted to him."